There’s a reason why it’s called a “housing crisis” – rather than a “healing housing market,” as some pundits might prefer. It boils down to this: Many middle-class people who grew up in San Francisco can longer afford to live in a city where money from all over the world is now sloshing around knee-deep. They have trouble buying or renting a halfway decent place, though they might be able to shack up with a bunch of people, and that’s great, it works for a while, especially for younger folks. Those who bought a home or rented a rent-controlled apartment a long time ago are fine as long as they don’t move. For renters a move can happen when they’re evicted. Then they have to go find a cheaper town to live in. It’s not exactly the American dream. School teachers even. Property prices have skyrocketed. According to Paragon Real Estate Group, based on MLS data through July 2, the median condo price has jumped 74% since Q1 2012 to $1,125,000 and the median house price 104% to $1,356,000. If a household earns the median household income, forget buying. Leaves renting. In its new SF Bay Area Apartment Market Report, Paragon found that in the first half of 2015, the average sales price of apartment buildings with 5 or more units has jumped 82% since 2009 to $485 per square foot. The per square foot averages range from $394 in larger buildings (5-15 units) in the Mission to $845 in smaller buildings (2-4 units) in Pacific Heights. Prices are based on the interior living space and don’t include garages, basements, decks, and rooms or units built without permits. Average asking rents have soared too, in a dynamic where higher rents lead to higher property values which lead to higher rents…. It works as long as rental units are in short supply, and as long as people from all over the world are following the siren call of startups with big valuations but no profits, where investors rather than operating profits fund some or all of the expenses. 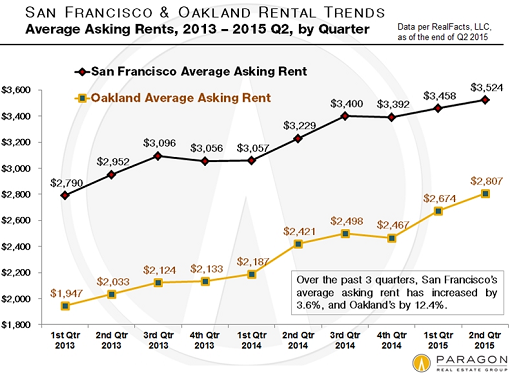 This money has triggered the “housing crisis”: Average asking rent in Q2 this year reached $3,524. That’s up from $2,243 in 2010, the dip after the Financial Crisis. A 57% jump in 5 years. 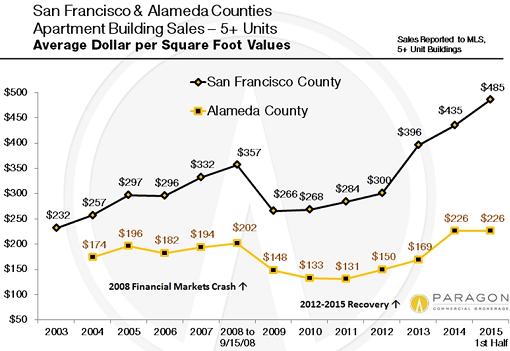 Over the same period in Oakland (Alameda Country), just across the Bay, average asking rents have soared 88%. Too little inflation? We’re better off ignoring these facts on the ground, apparently. 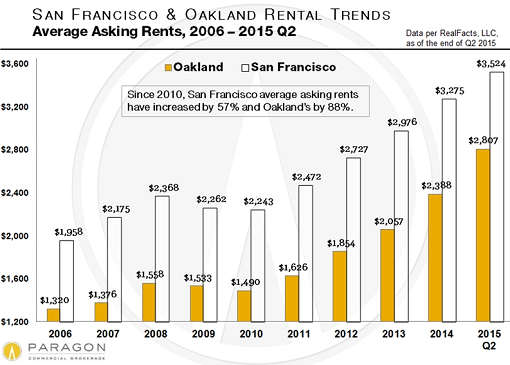 Since Q1 2013, asking rents in SF have risen 26%. In Oakland, 44%, including over 12% in the last three quarters alone! Paragon Chief Market Analyst Patrick Carlisle explains that both cities have experienced “incredible appreciation” in rents. But Oakland’s increases have accelerated due to the “classic ‘overflow’ effect.” It’s now “a major go-to option in the face of SF’s extremely high rents.” Hence the insane price pressures across the Bay. What’s next in the boom-and-bust cycle by which San Francisco lives? Enthusiasm, endless optimism, lots of money, and: a phenomenal building boom! “There are hundreds of residential building projects in San Francisco’s development pipeline, totaling more than 60,000 potential new housing units,” according to a report by the San Francisco Business Times. About 9,000 units are currently under construction. After the boom, the bust. That’s the rule in SF. But not yet. The “housing crisis” is not a crisis for those on the inside, such as developers, realtors, current homeowners, people with enough money to easily pay for whatever they want, or for people in rent-controlled apartments who haven’t been evicted yet. And it’s not a crisis for the various levels of government because the associated activities throw a lot of taxes their way. For them, it’s nirvana. A month later, the City issued its own report that found that between November 2013 and February 2015, there had been between 5,249 and 6,113 Airbnb listings, even though these types of short-term rentals of 30 days or fewer were illegal in SF until February 2015. An effort to tighten the screws on short-term rentals by imposing a “hard cap” was rejected by the Board of Supervisors in a 6-5 vote last week. But an initiative to limit the use of housing for short-term rentals to 75 days a year has qualified for the November ballot. It boils down to an argument between two sides separated by the money line: those that cannot afford decent housing and those benefiting from high home prices and rents. Airbnb is valued at $25.5 billion. It received $2.3 billion in investor money, part of which gets spent in SF directly or indirectly, including on housing that will drive prices and rents further into the stratosphere. Airbnb does what SF startups are supposed to do: lead the boom, hire a lot of people, offer them the sky, blow a lot of investor money, ignore the consequences, and somehow survive the bust that always comes. The fact that this argument even exists in San Francisco and that it has taken on such importance shows just how crazy the “housing crisis” has become.